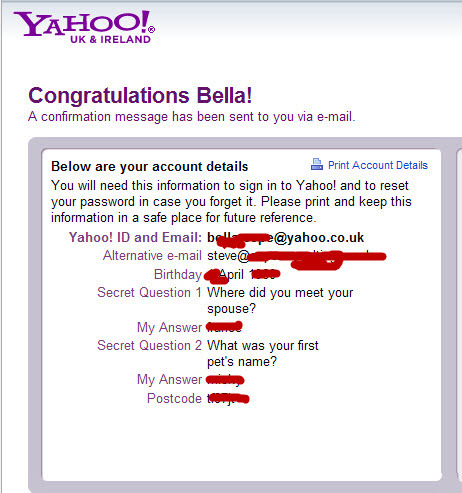 You should also note that your Yahoo email account, and your main Yahoo email address are the same thing. This means that if you close it you will not only lose access to email but to other Yahoo services. If you are cancelling because you have forgotten your password then try to recover or reset the password instead. 1. You may have given the email account to contacts and friends and they may still send email to this account. 2. The email address may already be listed in various email directories, and people searching for you may find it there. 3. If you change your mind you may not be able to get your old email address back. 4. If you only have one email address then to cancel it you will need to cancel the Yahoo account. This means that you loose access to other services like Yahoo groups etc. 5. Cancelling the email account doesn’t necessarily cancel billing. If you have a premium Yahoo email account cancel the billing first. 6. If you have old email messages that you may need to keep. You need to access your mailbox using an email client and save the emails to your computer or copy them to a new account. Therefore before you delete or cancel your Yahoo account, or any email account, ensure that. 2. Everyone is informed that you are no longer available at this address and give them your new address. 3. Export any contacts that you will need to use in the future. See this article: exporting and importing yahoo contacts. 4. Export old emails that you may need in the future. 5.That you delete yourself from the directories, in the case of Yahoo-People search. 6. You definitely don’t need it any more. Here is a direct link to cancel your yahoo email account.-Deleting Your Yahoo email Account. (note – you will need to sign in). Also Note if you don’t care about email sent to that address and you haven’t paid for any premium services then you don’t need to cancel it just stop using it, and Yahoo will eventually disable it (currently after 4 months). Before You go! – You’re probably in a rush to cancel you email address but what are you going to use instead? …..Another free address? The fact that you are cancelling one means that you have probably experienced the limitations of free email. So what email address is best?.. Well in my opinion your very own.. one that belongs to you. Your own Personal Email Address.